Review: Imagine finding an extensive trail of blood leading to a man's murder! Break and Enter by Norah McClintock is a spine tingling story for people who like a spooky juvenile abstruse mystery. Break and Enter is the 4th book in a fantastic series of Chloe and Levesque. Chloe thinks the new substitute Mr. Green is a regular replacement for her history teacher, but is he framing Chloe for breaking his car and cheating. Break and Enter is an extremely terrifying page turner, but I recommend reading it in daylight. When Mr. Green passes out a final history test, Chloe knows she is prepared. 5 minutes later Chloe is sitting in Mrs. Jeffries' office, the principal. Mr. Green had found a cheat sheet under Chloe's desk, but her problem is that she did not make that sheet. That is when Chloe realizes she is being framed, but she also realizes that all her so- called, "friends" are really her enemies. Chloe becomes even more interested in what is going on when she finds herself wrongfully sitting in detention supposedly for breaking into Mr. Green's car. That is when Chloe's father the, Chief of Police, comes into the plot to stop the framing of his daughter. One Saturday afternoon Chloe goes to the police station to see what the officer has discovered about the fingerprints she had collected. When Chloe finds out that the fingerprints are a dead end, she walks through the woods to get home. But, on her way she finds a cottage driveway with some sunglass lying on the ground. She decides to do her good deed of the day and return it to the owner. However, when she knocks on the door, it swings wide open and Chloe is greeted by a reddish- brown trail of splotches that lead Chloe into the garage where she finds a man inside the car reaching for a cell phone, dead and bloody. I have read many creepy mysteries, but this is the best suspenseful mystery I have read. Norah McClintock has succeeded in writing another gripping mystery in the Chloe & Levesque series. The details on every page make you daydream the story in your head. Break and Enter is a very suspenseful book because the plot makes you read all the way to the last page to see who lives to breathe again. In this book I like how Chloe starts off hating everyone, but her relationships with her enemies change when they start to do things for each other. This book is special because from the first sentence the book is interesting and many books do not get to the point until the second chapter. Norah McClintock nailed this book with a boatload of creative writing and filled it with suspense along the way. In my opinion, the ending was exceedingly thrilling because of the detailed action and the dangling question of who will die next. To conclude, Break and Enter is a book that shows you the thrills of crime and murder. This book is great for people who like horror movies because it can create one in your head. 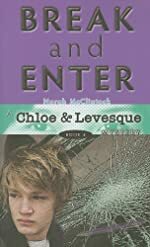 Break and Enter will make you want to read all the other Chloe & Levesque books as well. Norah McClintock does a great job writing crime novels so do not read alone at home. We would like to thank Kane Miller for providing a copy of Break and Enter for this review. Have you read Break and Enter? How would you rate it?